(Beijing) — As the government intensifies efforts to promote debt-for-equity swaps to ease the burden on state-owned enterprises (SOEs), Agricultural Bank of China (ABC) has set up a private equity fund aimed at raising more money to finance transactions while also shielding the bank’s balance sheet from the risks and potential losses. 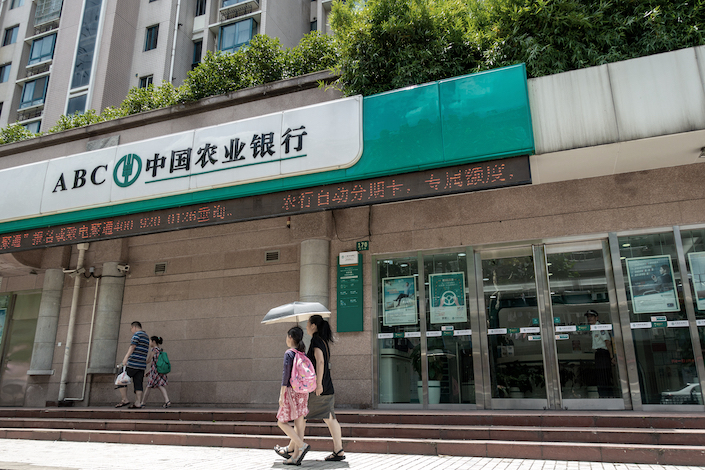 ABC Capital Management Co. Ltd., was registered on Monday in Shanghai with a registered capital of 500 million yuan ($73.3 million), Caixin has learned, making the Beijing-based bank the first state-owned lender to set up such a fund. The new company is a wholly owned subsidiary of ABC’s asset management company (AMC), which was set up last year to handle nonperforming loans and other soured assets. It will use the money raised from outside investors to buy equity stakes taken by the AMC in debt-for-equity swaps. The “big four” state-owned lenders have been at the forefront of the debt-for-equity initiative, first highlighted in Premier Li Keqiang’s work report to the National People’s Congress in March 2016 as a way of bringing down corporate leverage ratios and containing financial risks. Such swaps involve a company’s creditors exchanging the debt they are owed for an equity stake. Alternatively, an investor can inject capital in exchange for shares, giving the company money that can be used to repay debts. The country’s five biggest commercial lenders – Industrial and Commercial Bank of China, Bank of China, China Construction Bank, Agricultural Bank of China, and Bank of Communications –– have all set up asset management companies (AMCs) to deal specifically with the issue of resolving corporate debt through swap agreements. But progress has been slow. In the first six months of 2018, only seven companies signed swap agreements to turn 100 billion yuan of debt into equity, taking the total to 109 firms since a pilot program was formally approved in July 2016, according to data from the National Development and Reform Commission, country’s economic planning agency. Swaps worth only 50 billion yuan were implemented during the period. As of the end of June, swaps involving 1.7 trillion yuan of debt have been agreed, but only about 20% have been implemented, NDRC data show. Among the reasons put forward by government officials and bankers for the lack of progress are difficulties raising enough money to inject into debt-ridden companies, and concerns over whether banks and other investors can earn an adequate return on their investments. In recent weeks, policymakers have taken steps to support the program. The People’s Bank of China in June cut the reserve requirement ratio (RRR) for some banks to release more cash specifically to support debt-for-equity swaps. The banking regulator said last week that it would allow lenders to set aside less capital as a cushion against risky equity investments that go bad. And in a joint statement released Wednesday, five government agencies vowed to bring in more financial institutions, including private funds, to take part in the swaps, and said more measures will be taken, including cutting the RRR further, to lower the funding cost of such swaps. The new private equity subsidiary set up by ABC aims to overcome some of the obstacles that have held back the banks, analysts and executives involved in the debt-for-equity program have told Caixin. It will be ring fenced, in that its assets will be kept separate from the bank’s other operations, and the assets, provisions and losses incurred will not have to be consolidated onto the balance sheet of the distressed debt unit, and hence the bank itself. That means ABC won’t have to meet the high provisioning requirements set by regulators. “If there is a separate unit that holds the equity stakes (from the swaps), then the bank’s asset management company does not need to set aside capital to cushion the bank’s balance sheet against losses,” analysts at Industrial Securities Co., Ltd. wrote in a report.